As John's thirst for flavors grew, his bank account dwindled. "Poverty led me to home brewing," John jokes. Lucky for the Blind Tiger and fans of craft brews. Tapping an Idea The Blind Tiger Brewery and Restaurant opened its doors at 417 SW 37th St. in 1995 as Topeka's first craft brewery. At the time, it was also the largest in the state. Four years later, John, who'd started brewing professionally, came on board as brewmaster. "I just absorb beer knowledge anywhere I can," he said. "In the early years, I was reading books and books and books. Any chance I get to travel out of the country and try new beers, it's a palette education." As John learned, so did Topekans, and the Blind Tiger quietly gained a following of devoted beer lovers, who also could get a good meal while they sampled John's latest creations. Jay Ives was among the fans. He'd made a career in the telecommunications and computer businesses, but, nearly nine years ago, sat down with the Blind Tiger's former owner, Jim Caplinger. "I always wanted to own my own business and, when I was 55 and had a nice nest egg built up, I thought it was time to do it," Jay said. "I wasn't a craft beer aficionado at the time; I wasn't a foodie, but I was a customer service fanatic." The Proper Tools Jay did some updates and retooled the menu, but he knew the Blind Tiger's niche was its beer, with John its hidden talent. "The best business decision I made was to let John be John and brew the beer the way he wanted to do it, and that he had the tools and ingredients he needed to do it," Jay said. "That is the secret of the success of the Blind Tiger." Both say the major ingredient in their beers—the water—is one they have by luck. It comes right from the faucet via Topeka's municipal water system. "You need good water to brew good beer and Topeka has excellent brewing water," John said. From there, John launches into a litany describing malt and hops and yeast. He not only samples from a variety of suppliers to find the best quality, he then plays with the brewing process to create the right flavor. He describes malt bills, the way in which he'll malt the grain to varying degrees of doneness, from tan colors all the way to nearly black. He says bitterness, aroma and flavor come from the hops, and the timing of when he adds them as his mixture is boiling. Finally, in goes the yeast for the fermentation process. That, too, comes in varying flavors and components. Jay says it's something for which John has a natural skill. "(John) has a sensitive nose and palette," Jay said. "You wouldn't be surprised if a baker could take a few bites of someone else's cake and go back and know the ingredients. John does that with beer." John has a simpler assessment. "I just wake up and think, 'I'll invent a new beer today,' and away we go," John said. "That's the fun of brewing beer—you get to drink your mistakes." Also fun is coming up with names for those creations. Mister Blue Sky and Smokey the Beer are among John's favorite, along with Little Red Corvette, which he says pokes fun at some of his friends who made mid-life sports car purchases. It became their favorite to drink. Tasting Success Jay launched a marketing plan after taking over to reintroduce Topekans to the Blind Tiger. In the first year, their beer sales doubled. Today, they're four times what they were in 2007. Jay credits John and his team, which includes a head brewer and two other brewers. 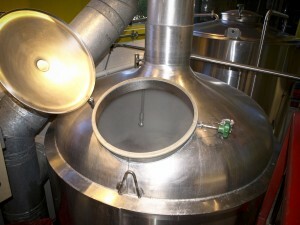 "Some brewers are inward looking and brew what they like. John is outward looking," Jay said. "He talks to customers to find what they like. He continues to work at improving his craft." Case in point, in 2014, John was named Champion Brewer at the World Beer Cup, a competition featuring 4,754 beers from John Dean, Brewmaster and Jay Ives, Owner Blind Tiger Brewery & Restaurant1,403 breweries in 58 countries. His entry was a wheat beer. Jay says the first thing John did after winning was walk across the street to purchase a new book he'd seen on the subject of brewing wheat beers. "He wants to make it better," Jay said. Barreling Ahead Even with an international reputation, people still need to visit Topeka to get a taste of what they're missing. 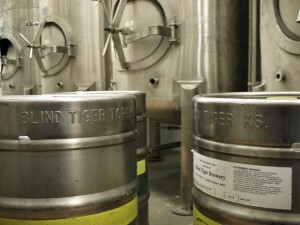 The Blind Tiger currently puts out about 1,300 barrels a year, or 350,000 pints. The vast majority of that—about 90 percent—is consumed by the glass at the bar and restaurant. Another seven to eight percent is distributed in kegs to about a dozen restaurants in the Topeka area, with the remaining sold in half-gallon growler jugs to take home. They sold about 1,000 of those in September. "We never jumped up and said we're going to build a microbrewery and be big," John said. "We just wanted to keep up with demand and keep customers happy." That's not to say they're not eyeing the potential for more customers. This fall, an expansion added a cold room and 12 more steel tanks in an adjacent building that most recently housed a day spa. It should add about 40 percent to their brewing capacity. "We'll see if Topeka keeps drinking that up under this roof or if we can expand to Kansas City," John said. John, long ago, stopped counting how many different brews he's developed over the years. He does know you'll always find six flagship beers on tap at the Blind Tiger, plus four to six more flavors, often dependent on the season. They encourage you to try a small sample if you don't think you're a craft beer fan. Nov 13 Made in Topeka: PT's Coffee Roasting Co.